Nerve growth factor (NGF) and other neurotrophins were identified because of their trophic role for distinct populations of neurons in the peripheral nervous system. We know that neuronal cell death is regulated by a genetically encoded programme, called apoptosis, that is conserved from worms to humans. Dysregulation of this programme is thought to contribute to neurodegenerative diseases which are characterized by the loss of neurons. 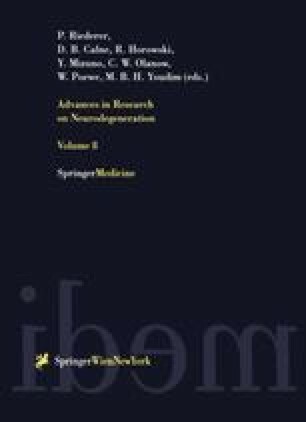 This article will review recent findings about the motoneuron disease spinal muscular atrophy (SMA). Two closely linked candidate genes for SMA, the SMN (survival motor neuron) gene and the NAIP (neuronal apoptosis inhibitory protein) gene have been reported. The SMN protein forms a complex with several other proteins and this complex containing SMN plays a critical role in the assembly of spliceosomes and in pre-mRNA splicing. NAIP, cIAP1 (inhibitor of apoptosis-1), c-IAP2, X-IAP and survivin comprise the mammalian inhibitor of apoptosis family. Its members can protect mammalian cells from apoptosis induced by a variety of stimuli. Some of the IAP molecules have been shown to interact both with cell signalling molecules and with specific caspases but details concerning their cellular role are only incompletely characterized.